How to Easily Exclude Unnecessary Hits in Web Log Storming? Excluding unnecessary hits from Web Log Storming reports by using global filters is an effective way to improve software performance. Newly added option in version 2.2 makes this process easier. Please read this short tutorial to see how to use it. How to Easily Exclude Unnecessary Hits? This entry was posted in Uncategorized and tagged analytics, analyzer, log, software, statistics, web on August 27, 2009 by Vladimir. Web Log Storming v2.2 is now available for download. Changes in this release include several small new features, improvements and bug fixes. 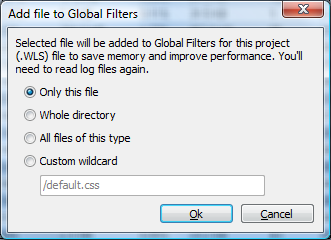 Now you can more easily add unnecessary files to global filters (see “Improving performance” suggestions). To use it, view any of file reports (pages, files, images, directories, etc), see which files take lot of hits that doesn’t affect your stats (style sheets, logo images, etc), right click on them and choose “Add to Global Filters” option. Next time you read log files these will be excluded from reports. This one is available in Sessions, Domains and Session Details report. You can now change visitor’s domain name to any text you like, so instead of having something like qwerty123456.domain.com, you can describe visitors as My home network or Important customer. If you don’t need some of options, you can now buy less expensive Standard edition of Web Log Storming. Currently, Standard edition costs $119 (US) while Professional remains at the same price point ($189). Removed features include goals, host resolving, exchange options (export, print, send by e-mail, …), some reports, etc. For full list of differences please refer to this page. Upon start, users who are evaluating trial version can choose which edition they want to try out. Existing customers won’t notice any change from this as all of you already have Professional version. Other less important improvements and bug fixes. This entry was posted in Uncategorized and tagged analytics, analyzer, log, software, update, web on August 24, 2009 by Vladimir.